Historically stocks and bonds have tracked each other with opposite correlation. The reason for this is because when investors sell stocks they typically allocate some or all of that money into bonds. Stock prices will fall and bond prices will rise. The same happens when they sell bonds. Stocks will rise and bonds fall. You can think of it like a see-saw. Whenever the two separate they always find a way to come back together. The separation between the two is called the spread. You'll notice that in March of 2009 the stock market bottomed and took off upward. However, bond yields did not budge. They have since tracked sideways at a very low rate and have recently fallen even further. 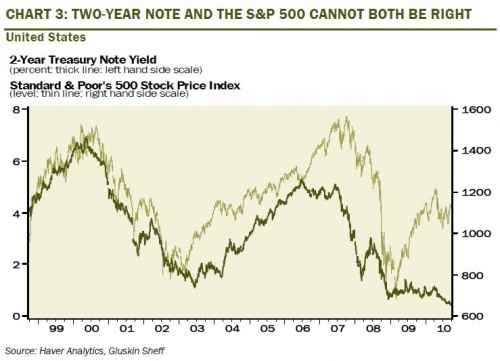 This means that the bond market does not believe in the stock market rally. One of the two markets must be right. One of the two is overpriced. Historically, the bond market has been correct because it is a much larger market than stocks and is less influenced on short term emotion. 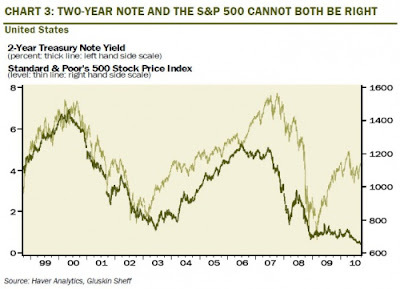 The chart above also shows that based on current bond rates, stocks should be priced below the March 2009 low of 666. So who do I believe? I think they are both overpriced. I think stocks will fall and bonds will fall. I believe ultimately investors will move away from American stocks, bonds, real estate, and cash. They will all fall simultaneously. In the meantime, I continue to accumulate real cash (precious metals) to have gun powder ready to buy when these assets finally reach an attractive purchase price. Real estate should be hit the hardest and will provide the greatest opportunity during the coming collapse.